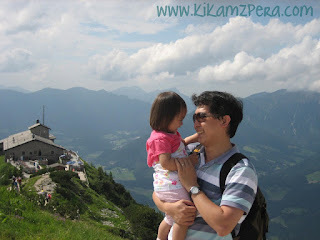 Photo taken at the Kehlsteinhaus, Hitler's famous Tea House that sits on top of a mountain. Received this fun HUBBY TAG from Ate Chris of The Mommy Journey and Enchie of Sweet Nothings. I would love to share this with Tetcha, Seiko, Bambie, Juliana, Niko, Janis and Ria. Let's see what our hubbys have in common. 3. What's one food he doesn’t like? 4. You go out to eat and have a drink, what does he order? 5. What shirt size does he have? - He is M here in Germany but L in Japan. 6. What shoe size does he have? 8. What would he eat everyday if he could? - None. He wasn't able to vote since he turned 18! 14. What is something he does, but you wish he wouldn't do? 16. You bake him a cake, what kind of cake? - Never baked a cake for him yet. He doesn't like cake that much. - Judo 18. What could he spend hours doing? - Internet. Play videogames. Watch movies or TV series. 19. What is the unique talent that he has? 20. What's his type of coffee? Thanks for this tag Mommy Kikamz gonna post it. Thanks for this tag, mommy. Will be posting it on my blog in a while.